In my classes and extracurricular activities at Winthrop University, I try to incorporate old movies as much as possible. Recently in my Media Ethics (MCOM 410) class, we were required to write a 10 to 12 page paper on an issue in diversity in the media. It could be movies, television, newspaper articles or etc. Of course I wanted to write about movies. Instead of taking the route of how certain minority groups are stereotyped in films, I decided to write about how white actors played minority roles in films-and this happened a lot in films. White actors and actresses would don heavy make-up, false noses and over-exaggerated gestures to play different ethnic roles such as Asians, American Indians or Hispanics. 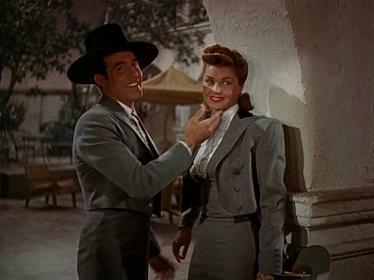 -Esther Williams playing Ricardo Montalbon’s twin sister in “Fiesta” (1947) and how she thought this was ridiculous. From my research and information I have gotten from Robert Osborne on TCM, whites played minority roles like these in films for a couple of reasons. 1. White audiences did not care to see authentic minority roles due to racism. It seems they preferred to see a white playing the role stereotypically. 2. 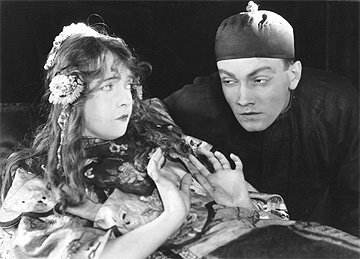 If there happened to be a romance between a white and a minority (“Bitter Tea of General Yen”) white audiences would shun an authentic interracial relationship. Interracial romances were banned by the Hayes Code. On a side note, 70 year old professor, Dr. Click, seemed to enjoy my paper and said he was informed on a new topic.